Since the release of the iPad, enterprises have seen the potential of this amazing device to bring an easy mobile user experience to people on the move. It is particularly interesting to people that have to interact with those in the community. Tablet devices like this have the potential to replace the “clipboards” of yesterday. To interact with all members of community effectively, being able to produce a paper printout on the move is necessary. Admittedly this will only be required for the next few years, but it’s still needed for the device to be used in the way it needs to be. Apple offer a solution for iPad and iPhone printing called “Airprint”. This is a printing system that means that the mobile device does not have to use printer drivers. These are built into the printer. In addition it appears that “Airprint” requires a WIFI network. So you need an “Airprint” compatible printer and a WIFI network or a printer that supports ad hoc network connections. Some of the Brother range of printers support Ad Hoc connections. 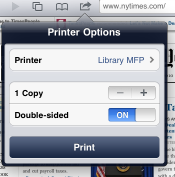 This means that the printer can be seen as a “WIFI” network which your iPad can connect to. You can then print without a seperate WIFI network. This page will be updated with more information as it becomes available, so watch this space.